DIB D-Lock Discounts Apply ! 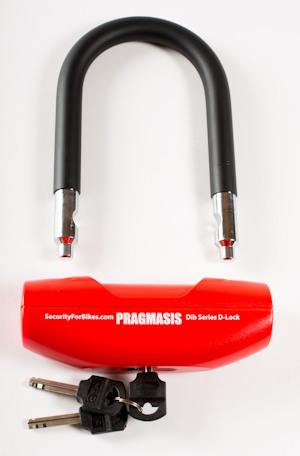 NEW: Our custom-made SecurityForBikes DIB-Series compact D-Locks. This is a genuine motorcycle-grade D-Lock, with true 16mm thick steel shackle. Double-locking and guaranteed impossible to bolt-crop by hand. 260mm x 87mm internal clearance. It is usually a good idea to use the smallest size that will do the job. Sold Secure Motorcycle Gold/Quad & ATV Gold/Bicycle Gold/Motor Scooter Gold approved with any appropriately-approved chain and also on its own. Also Police Preferred Specification. 16mm diameter hardened steel shackle plus rubber covering (18.2mm diameter overall, including the rubber sheath). Heavy duty hardened steel lock tube with improved design alloy insert (not plastic, like some competing products!!!). Disc detainer anti-pick cylinder with 9 discs, protected by rotating anti-drill hardened alloy steel plate. Weight: 1.5kg (for the 130mm version; 1.7kg for the 190mm version and 1.92kg for the 260mm version). Sliding keyway cover to keep dirt out of the cylinder. Very versatile and a perfect partner for Protector 16mm/13mm/11mm chains at a great price! Particularly suitable as a portable security option for motorbikes and high-value bicycles, either when locking the bike frame directly to something solid in the scenery, or when partnered with a suitable chain (and even a noose chain). NEW and Unique: We are also able to supply spare shackles for these locks. Please see the separate listing if you want to buy a DIB in one size and perhaps a spare shackle in another size, to give more options in how you secure your property. Please click for more details on the DIB D-Locks. Very strong with a 16mm shackle that’s available in two lengths, plus available to purchase separately. Substantially well made D lock arrived today only 2 days after ordering. Tracked all the way by DPD, this is the fourth quality product supplied by Pragmasis, thoroughly recommend them for your security requirements. Haven't had it put to test yet, but looks and feels very substantial, Thieves should have a hard time removing this. Ordered and delivered in a couple of days.